Samhian is here, and the veil has thinned between worlds, ours and the spirit realm. 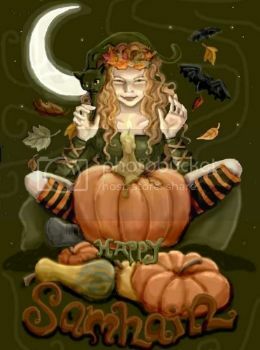 Upon this night it is the best time to practice your divination. So breakout your cards, scrying mirrors and your runes and get witchy with it! However don’t forget your masks as you travel about. For not all spirits are benevolent and kind that roam the earth this night. Your mask will allow you to confuse them and pass by undetected. 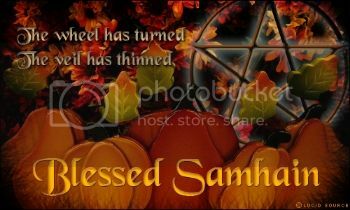 Samhain is my favorite Sabbat, because it is a time of new beginnings. Like the “Death” card in your tarot deck, this is the time of the greatest change. It is a time of great reflection, to find the need and fix it. If there exist an aspect of your life that you are unsure about, have a reading done, either by yourself or someone else, and find out what to expect or what needs to be changed. Embrace the change and let yourself be one who flourishes. Think upon your loved ones, those who have passed through the veil for this night they are with you. I am sure you have felt it this past month as we drew closer to this day, that you felt a presence, or stopped and remembered a happier time when they were still alive. But the point of such reflections is not to become despondent or depressed, but to recall and rejoice for the life you had the honor to share with them. Honor them on Samhian, honor their memory, recall the good things and share it with others; then hope to meet them again in the next life. For to quote Charlotte Bronte, “Bear a cheerful spirit still; never doubt that fate is keeping future good for present ill!” So I wish you a hearty Celtic New Year, and a happy and safe Samhian.